A favorite among New Yorkers, The Halal Guys has finally opened its first East Bay outpost in Berkeley. 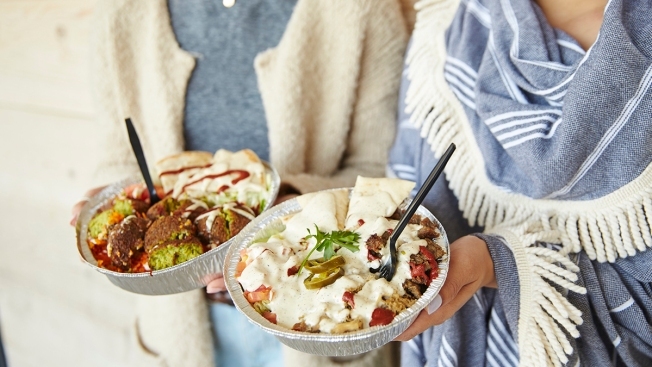 Popular New York City chain restaurant The Halal Guys opened up a storefront in Berkeley last week, drawing hundreds of customers to the first East Bay location of the beloved Middle Eastern eatery. With nascent beginnings as a hot dog cart in Manhattan, The Halal Guys has been in business since 1990. The newest location sits on Center Street in Berkeley and is open from 10 a.m. to 12 a.m. There are several other iterations across the Bay Area, including spots in San Francisco and San Jose. All told, there are more than 200 locations across the U.S. In addition to the much-adored “white sauce,” customers can order the shop’s famous Gyros, Baba Ghanouj and other combo platters. Everything on the menu is under $20, with some items cheaper than $10. More than 1,000 people RSVP’d to the store’s grand opening last Friday, although the Berkeley outpost quietly opened for delivery-only via Caviar two weeks earlier.